If you would like to bid on a wild horse this year, mark February 28th on your calendar and plan on attending the Innisfail Auction Market. This year’s capture season is radically different from those in the past. Wranglers have been hired by the ESRD to capture a quota of between 50- 60 horses from the Ghost Equine Zone, with the emphasis being on capturing the most adoptable horses to be made available to the public. In the past capture permit holders would capture the horses with the horses then becoming their property. 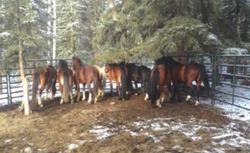 WHOAS (Wild Horses of Alberta Society) will get first pick of the captured horses for their adoption program. Any horses that WHOAS is unable to accommodate will be offered to the public at the Innisfail Auction Market February 28. So far 26 horses have been captured, with the capture season ending at the end of the month. As of press deadline, WHOAS has taken in 13 of these horses. If you would like to stay up to date on the numbers you can check WHOAS website http://www.wildhorsesofalberta.com/ or check their Facebook page. If you would like to adopt one of the horses that WHOAS is taking in and gentling, email them at WHOASalberta@gmail.com. When asked if it’s been difficult coordinating picking up horses as they come in Bob Henderson, President of WHOAS has nothing but praise for everyone involved. “From the wranglers to the auction staff we couldn’t ask for better and our volunteers have worked tirelessly to make everything run smoothly at the WHOAS handling facility.” he says. Henderson goes on to mention that the auction staff even stopped everything that they were doing when they were there to make it easier for them to load the horses being taken back to their facility. At this point it’s impossible to know exactly how many horses will be made available to the public through adoption or auction. The one thing that is certain though, is that time is running out. If you’ve ever wanted a wild horse now is the time to act either by contacting WHOAS about adopting or attending the Innisfail Auction Market February 28 to bid on one. The tack sale will be starting at 10 am with horses following.